This is derived from THLeaderH's One-way Two-lane Road Patch thread. One-way Two-lane Road Patch (OTRP) is a very interesting patch but it's too complicated to introduce in standard. However, I think part of feature of that patch, building one-way road without any sign and "Halt Mode", is worth integrating. So, I rearranged OTRP with standard overtaking rules. You can get .diff file based on r8555 from this URL. My main dislike is that the oneway road is a massive thing just for streets, while I would rather like something like a more general wayobj. This would link the directions with clear visual signs at intersections, and would furthermore also be more incentive to realise multiple wayobj on one tile. Furthermore, such single wayobj would work on any way, including airstrips. Has that branch been stabilised yet in terms of reliability, consistency and multiplayer? How about expand this feature for other ways? I think it's better. Requiring special .pak doesn't sound good because pak makers would have to make that wayobj. I think these problem are mostly related to the overtaking algorithm of OTRP. Therefore my patch doesn't have serious bugs. Since this is now a new branch, it would be interesting to implement a patch for the double diagonal tracks, it would be a great project. This is something entirely different. It would imply more than a single way of the same type on a tile. It will be a massive patch with lots of chanches for errors in routing driving stopping and construction. So do not hold your breath. It would imply more than a single way of the same type on a tile. Not necessarily. It can be done by replacing the ribi-system with a system that keeps track of which edge is connected to which of the other edges. Reservations would have to become more complicated as well. 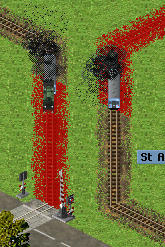 Although players would perhaps expect that they can build a low-speed track in one corner and a high-speed track in another. That would indeed require two different ways, with different descriptors, but the same waytype. What if I want rails in one corner and maglev in the other ? That is ways of different types. It is possible to have more than one, although I think it's only up to two, ways of different types on the same tile today. Usually crossings, but you can have a road and a tram track curving in different directions. It is no small task. There is no denying that. But it is the obvious solution to a whole lot of things people have wanted (or thought they wanted). Some sort of system that not only tells which direction a vehicle can move on a particular tile, but which direction it can move based on which direction it came from would enable not only tighter diagonal tracks, and maybe even roads, but also turn restrictions in junctions. Some sort of intra-tile lane system could support this, as well as a less hackish way of doing multiple lanes in the same direction, plus bus stops at the side of the road and turning lanes. However, I have no idea how to make a user interface for this that doesn't frustrate the player. The latter might also complicate things for those making way paks.